Despite it being just five days from extremely strong signs of a Google update, which Google denied, Google announced yesterday on Twitter that they have pushed out a new Panda refresh. 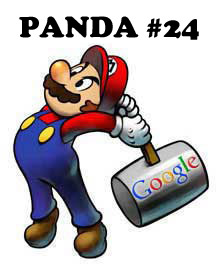 This would make the 24th revision or refresh to the Panda update since launching in February 2011. This update has a noticeable impact of 1.2% of English queries. The previous once, version 23 on the holidays had an impact of about 1.3%. Honestly, the forums are not that noisy about this change. The January 17th change, which Google said was nothing, seemed like a much larger Google search update than this 1.2% Panda refresh they announced yesterday.